As the Vikings work on their offensive line problems, they know that quarterback Case Keenum has been effective on the run. As the Vikings try to get their offensive line back to full health following a loss to the Carolina Panthers in which they were missing three of their five starters, they can at least prepare for the Cincinnati Bengals knowing they’ve got a quarterback whose mobility is good enough to make plays from places other than a clean pocket. According to ESPN Stats and Information, Case Keenum has the NFL’s highest passer rating on throws outside the pocket this season, checking in with a rating of 120.6. He’s ahead of Carson Wentz — who might have been a NFL MVP favorite before tearing his ACL on Sunday — as well as past MVPs Matt Ryan and Tom Brady. Some of those throws have come on designed plays to get Keenum outside the pocket, or on plays where the quarterback can break outside to buy himself time for receivers to get open. Others, however, have come on plays where Keenum has been flushed from the pocket, like on Sunday, when he stepped up and to his left on 3rd-and-11 to find Adam Thielen for a 12-yard gain. 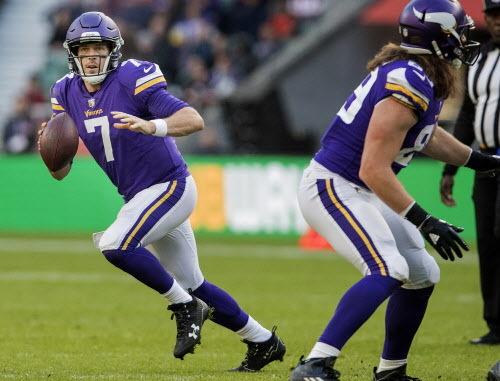 Perhaps Keenum’s best play of the day came in the second quarter on Sunday, when he managed to duck under a corner blitz from the 5-foot-9 Captain Munnerlyn, escape to his right and find Kyle Rudolph for a 13-yard gain. We’ll know more about the health of the Vikings’ offensive line when they hold their first practice of the week on Wednesday. It’d seem likely that Reiff will miss at least some practice time as he tries to return from a left ankle injury that coach Mike Zimmer said on Monday “isn’t as bad as [Reiff] thought.” Mike Remmers also told our Andrew Krammer on Monday that he hopes to practice this week — though it remains to be seen if he’ll be able to play Sunday — and center Pat Elflein said on KFAN on Tuesday that he’s optimistic he’ll play against the Bengals after sitting out on Sunday with a shoulder injury that limited him in practice last week. Things will be easier for the Vikings the sooner they get their offensive line healthy, but they always can use rolling pockets to help counteract pass rushes behind a makeshift line. Keenum’s mobility provides another tool at offensive coordinator Pat Shurmur’s disposal. And as ESPN pointed out on Tuesday, nobody has been more effective when they’ve broken the pocket than Keenum has this season.